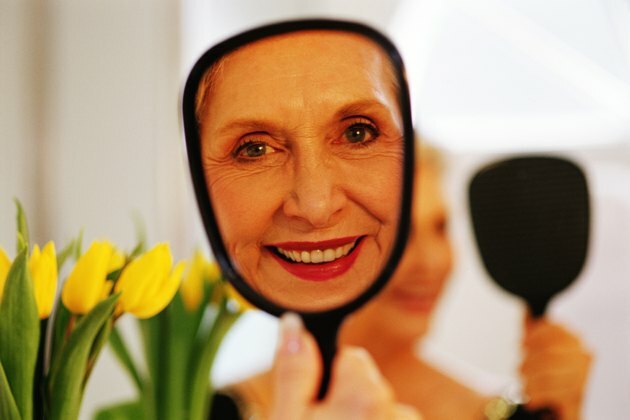 Women often experience different skin symptoms when they pass 40 years old. Some of these are due to bodily changes while others are due to external factors. If a woman over 40 experiences facial blotches and redness, there is always a cause, and some are more serious than others. Any time facial skin changes occur, women need to talk to their doctor to determine the cause and discuss any necessary treatment. Allergic skin conditions come in a variety of forms. Common symptoms include redness and itchiness, and some can cause bumps, swelling and scales. The most common types of allergic skin reactions that can cause redness and blotches on the face include hives, contact dermatitis and eczema, according to the American Academy of Allergy, Asthma and Immunology. In most cases, hives are caused by drug or food allergies. Contact dermatitis occurs when an area of the skin, such as the face, becomes damaged by a substance that comes in contact with it, such as plants, dyes, nickels or chemicals. Eczema can be caused by sweating or overheating, emotional stress or irritants, such as soaps. If a woman experiences hives or angioedema, an antihistamine may help alleviate her symptoms. Contact dermatitis can be treated with topical corticosteroid creams and cold compresses. Topical calcineurin inhibitors and topical corticosteroids creams are most often used to treat the facial redness and blotchy rash caused by eczema. For all allergic skin reactions, it is crucial to determine the cause and then avoid it to prevent further reactions. According to the Mayo Clinic, three out of four women who experience menopause will have hot flashes. Hot flashes are periods where you experience an intense, sudden hot feeling that affects the upper body and face, and they can be followed by symptoms such as nausea, anxiety, weakness, sweating and rapid heartbeat, dizziness, headache, and a suffocating feeling, according to BreastCancer.org. When a woman experiences a hot flash, she often becomes flushed, perspires and has reddened skin. In most cases, hot flashes are caused by hormonal changes that occur during menopause. It is estimated that in the United States, about 85 percent of women experience hot flashes as they enter menopause and for approximately two years after their menstrual cycle ends, according to BreastCancer.org. No specific treatments are available, but women can do lessen their symptoms by avoiding common triggers, such as alcohol, hot rooms or weather, caffeine, smoking, diet pills, hot showers, and spicy food. If women find their hot flashes to be particularly bothersome, certain medications may help, such as antidepressants, medications that lower blood pressure, products similar to progesterone, mild sedatives, and, in less common cases, estrogen therapy. Rosacea is a condition in which the skin on the nose, forehead, cheeks, chin and eyelids are chronically inflamed, resulting in redness, swelling, tiny blood vessels that are prominent or acne-like skin eruptions, according to Medline Plus, an online resource for the National Institutes of Health. What causes this condition is not known, but risk factors include being between 30 and 50 years old, being a woman, blushing easily and being fair-skinned. Although there is no cure, women can reduce flare-ups by avoiding any triggers, using sunscreen daily and trying to get as little sun exposure as possible, and limiting alcohol, hot beverages and spicy foods. Skin eruptions may be alleviated by topical and oral antibiotics. If rosacea is severe, the redness may be alleviated with laser surgery.